"Delicious Hawaiian bread that anyone will love--even those who don't like coconut! Eat it for dessert or with any meat hot off the grill. Tastes great warm or cool." Coat a 9x13 inch baking dish with cooking spray. Coat your hands with cooking spray or shortening, and roll the dough balls in your hands so that they have a light coating. Place in the prepared dish. Set aside in a warm place to rise until doubled, up to 2 hours. Preheat the oven to 350 degrees F (175 degrees C). In a small bowl, stir together the coconut milk, sweetened condensed milk and sugar. Pour this mixture over the top of the rolls as evenly as you can. Bake for 30 minutes in the preheated oven, until golden brown. Let cool for a few minutes before separating and serving. 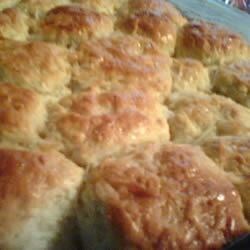 Pani Popo ((Samoan Coconut Bread)) the name Pani Popo is Samoan and this is a SAMOAN dessert!!! Never has & never will be a Hawaiian creation. Give credit where credit is due! ONO! I am from Hawaii and my Samoan friend makes these for me a lot. I am going to give her THIS recipe because by far...it is better! I love Pani Popo. Mahalo! This is not Hawaiian. It is Samoan as are the words. Good recipe though.